I first learned of the mansion and its eccentric designer from a collection of Ripley’s Believe It Or Not! Cartoons in my grade-school library. I never imagined that I would work there as a tour guide. These are the pictures I took there, and the stories that I told. that opens to reveal a wall. What room is this picture taken in? 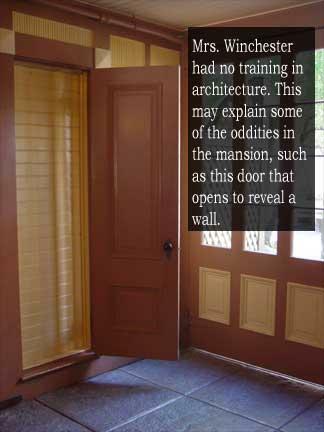 The door that opens to a wall is in the carriage entrance hall, in the back portion of the mansion. In the photograph you can see that the concrete floors are very rough. This was done intentionally to prevent the horses from slipping when they broght her into the house. This room is also the first room in the guided tour. Sorry, Stephen, I just can't let this go. Her lack of training in architecture is NOT any reason to suggest why this featue exists. Even the youngest of self-aware laymen (i.e. : my seven year old granddaughter) knows what is the function of a door. Our dear Sarah was off her nut, and, either on her own, or under the influence of ghosts, laudenum, or other such spirits, decided to simply build something. One thing to keep in mind, the idea that the design of the house was related to spiritualism was largely concocted by the subsequent owner of the mansion, T.S. Barnett, in order to sell tickets. There were rumors about Mrs. Winchester's eccentricities during her lifetime, of course, but taken as a whole it doesn't add up to much. In cases like this door, it's really more likely that it served a function at some point (probably as a closet), but the latter addition of new rooms led to it being walled up. According to interviews with her employees, Mrs. Winchester didn't work from blueprints of any kind. Instead, she just added rooms as she went. This is bad architecture, but it doesn't necessarily mean she was insane. After spending many hours in her house, I feel comfortable saying that Mrs. Winchester was fully competent mentally.